Although my mind and internal body clock are still convinced that Summer just began, my skin knows differently. I’ve spent the last few months slathering on SPF, frolicking in sand and salt water, and maybe neglecting those facials that I usually get so diligently. Fall is just around the corner, and despite LA’s still-broiling temps, my clogged, sun-drenched pores are in desperate need of some hydration and TLC. In summary; I’m nursing a summer skincare hangover while simultaneously trying to prep for the harsh dehydration that the next few months will bring. 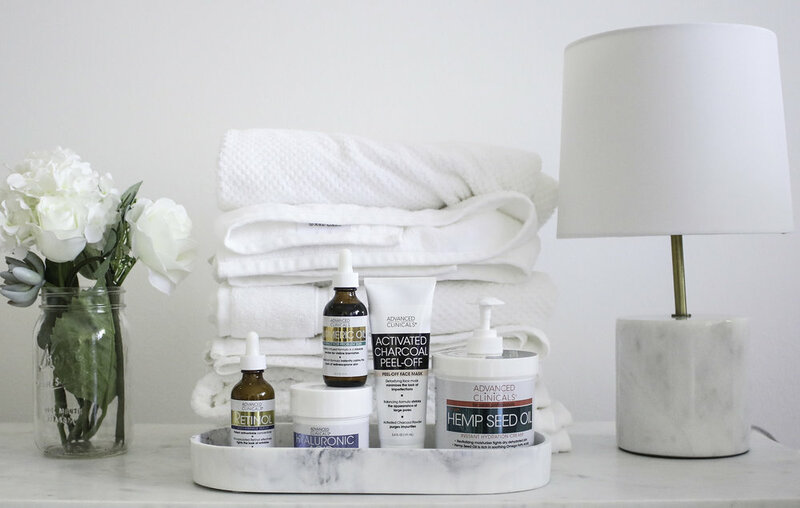 And just like swapping out your wardrobe staples for seasonally appropriate sweaters and booties, I’ve recently had to adjust my skincare routine to prep for Fall with the help of Advanced Clinicals. If you want to check out any of the products mentioned below, make sure to use my promo code, “MARISSA20” to receive 20% OFF your purchase from AdvancedClinicals.com! As you all know, I’m a total skincare fanatic, so finding the right products by the right brands is always a fun (albeit sometimes challenging) adventure. Usually, I seek out brands that balance scientifically-backed, of-the-moment ingredients and more natural formulas. Thankfully, I found Advanced Clinicals, which is a line of products developed by chemists who wanted to create effective formulations using advanced technology. Their powerful skin care solutions come at attainable prices for their customers, and one of my favorite things about them is that they focus on those high-quality, active ingredients (like Retinol and Hyaluronic Acid) along with more natural ingredients like Hemp Seed Oil and Tumeric Oil. So, without further ado, here are my favorite products for navigating that Summer-to-Fall skincare transition. 1. Activated Charcoal Peel-Off Mask: A few times a week, I like to give myself an at-home mini facial consisting of a few of my favorite masks of the moment. After a gentle cleanse, I’ll apply the Activated Charcoal Peel-Off Mask, a thick, gel-like black charcoal mask. After a summer filled with sunscreen, sand, and salt, my pores have definitely been a bit clogged of late, but this powerful cleansing mask helps reduce the look of oil and dry skin deposits. With Witch Hazel, Green Tea, Volcanic Water, Rose, Tea Tree and Willowbark, the mask both increases hydration due to its nourishing extracts while targeting clogged pores with the more acne-focused ingredients. I leave it on for about 20 minutes until its completely dry and start peeling it off— my skin always feels so clean and refreshed underneath! 2. Hyaluronic Acid Moisturizing Face Mask: One of my favorite ingredients to combat dehydration is hyaluronic acid, and after a dry summer, I’m prepping for Fall’s colder temperatures, so I really need it. I always apply this mask after the Charcoal mask as it helps hydrate the skin after cleansing the pores. The gel mask utilizes Glycerin, Hyaluronic Acid, Aloe Vera and Algae to plump up the look of fine lines and reduce the look of wrinkles by keeping my skin hydrated and nourished. It also instantly increases skin moisture retention while soothing and reducing dryness for a brighter skin tone. I usually keep this on for as long as I feel like, although it does start to feel a bit dry after awhile. I remove it with a hot wash cloth, and marvel and my plumped, brightened face. 3. Tumeric Oil : Easily my favorite step of this process is using the Advanced Clinicals Tumeric Oil. I always apply it to a clean face (after all my masking) and before my face moisturizer. Advanced Clinicals has an incredible arsenal of amazing oils and serums, but I was really excited to try out this one as I’ve never used Tumeric Oil before! Recently, tumeric has been a buzzy ingredient due to its soothing and anti-inflammatory properties. I love that it’s a non-greasy antioxidant oil that quickly rehydrates dry skin with natural redness-fighting botanicals. For me, it’s been a miracle for my sensitive skin— while my skin has been clearer of late for many reasons, this oil seriously helps whenever I have a little flare up of irritation or redness. It also smells amazing and only costs $15! 4. Hemp Seed Oil Instant Hydration Cream: Real talk, when it comes to moisturizing my face, I will spend hours on the requisite skincare routine, but when it comes to moisturizing my body, I’m SO lazy. This laziness is most likely the reason why I’ve suffered from keratosis pilaris (those pesky bumps on the back of my arms) for the better part of a decade. But this Hemp Oil Hydration Cream has finally convinced me to start body moisturizing! Hemp Seed Oil itself is rich in essential fatty acids like Omegas 3, 6 and 9, which revive my skin barrier, while Rosehip, Coconut and Evening Primrose Oils revitalize dehydrated skin. Soothing Arnica and Calendula diminish the look of redness and uneven texture, while ultra-softening Shea Butter and antioxidant Vitamin E defend against premature signs of aging. Though this could easily be a face moisturizer, I tend to use it mostly for my body as Shea Butter and Coconut Oil (in any product and any form) usually feed my breakouts. However, this cream has actually been a savior for my keratosis pilaris, as long as I apply it consistently! Advanced Clinicals has a pretty sizable range of products, so if you need more targeted solutions like Retinol, Vitamin C, or collagen boosting products, they’ve got your back. I also have a few honorable mentions that I’ve been using as well. The first is their Retinol Anti-Wrinkle Serum, which is a thicker, cream-like serum with Vitamin A to address fine lines, wrinkles, and dull skin. I’ve only used it a few times, but retinol is one of the best ingredients to address anti-aging, so I’m really excited to keep trying it! I’ve also been trying out the Collagen Plumping Sheet Masks, which are infused with Collagen, Hyaluronic Acid, Vitamin E and L-Arginine to reduce the appearance of expression lines and wrinkles while attracting moisture to dry skin. I love a good sheet mask, and this one definitely leaves my skin feeling and looking great. And finally, their Cracked Heel Rough Spot Cream soften calluses and replenish tough dry skin with nourishing and restorative cream packed with Avocado Oil and Shea Butter. I don’t suffer from super cracked heels, but they definitely make my feet feel really soft. If you want to check out any of the products mentioned above, make sure to use my promo code, “MARISSA20” to receive 20% OFF your purchase from AdvancedClinicals.com! Thank you to Advanced Clinicals for partnering with me on this post.